The full-gold crowns offer more durability and predictability than the ceramic options. 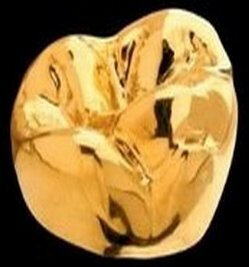 Gold has excellent biomechanical properties and is very gentle to opposing teeth, causing the least wear of those teeth. It can be more closely adapted to the underlying tooth structure than can any other restorative material, but does not have the appearance of natural tooth structure that porcelain has. It will not chip or break. Gold restorations will usually outlast similar restorations made from other materials.